Bill Clinton wrote the front page review for the fourth volume of The Passage of Power, Robert Caro’s biography of LBJ in The New York Times Book Review. 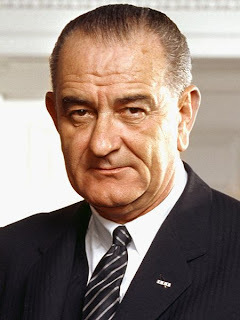 In the review, which appeared last week (NYT, "Seat of Power," 5/6/12), Clinton points out that while he split with LBJ over Vietnam, he admired him for his ability “to pass the Civil Rights Act, the Voting Rights Act, the open housing law, the antipoverty legislation, Medicare and Medicaid, Head Start and much more.” Power was the lingua franca of the Johnson years. “He knew how to get to you,” Clinton says, “and he was relentless in doing it.” The decision to assign the Caro book to Clinton might be one of the most brilliant in TNYTBR’s history. Like LBJ, Clinton was a big brash Southerner, who carried the legacy of Roosevelt’s progressive populist politics to another generation. From what you read, Johnson far outdid Clinton in his wanderings, but the difference between the two men was that Johnson never got caught, and if he had, he might very well have wrangled his way out of an impeachment proceedings through his sheer ability to intimidate. But here’s the real difference between Clinton and Johnson. Clinton could write about power, but Johnson knew how to employ it. He knew how to arm twist and be impolitic when he had to. Though they came from wildly different backgrounds, Roosevelt and Johnson were cut from the same mold. They both understood politics, in the sense that Machiavelli, the ur-realpolitician, did and in the sense that Clausewitz understood diplomacy. For all his vision and good will, the difference between Obama, Clinton and Johnson is that power is not even a word in our incumbent president’s vocabulary.